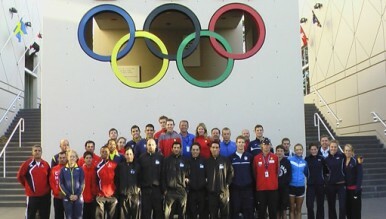 Pentathletes from seven nations joined Team USA at the Colorado Springs Olympic Training Center in preparations for the 2011 Pan American Games in Guadalajara, Mexico. Teams from Brazil, Chili, Argentina, Dominican Republic, Canada and Puerto Rico have spent the past three weeks working with USA pentathletes and coaches to acclimate to the nearly 6,000 foot altitude of Guadalajara. Men's and women's pentathlon at the Pan Am Games will be held October 15th and 16th and is one of the qualification competitions for the London 2012 Olympic Games.